If your customers are sweet on skulls try this Halloween Sugar Skull Shelf-Top Merchandising on the runup to the cashwrap. 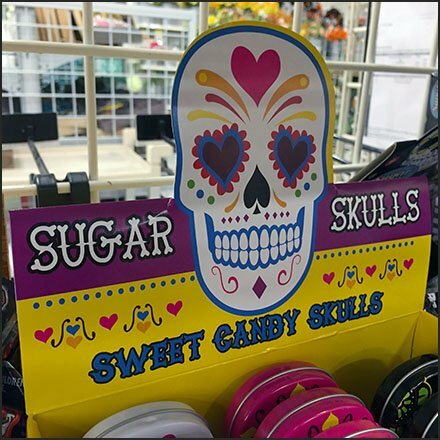 In addition to the actual taste these Sugar Skulls these also seem to to exhibit a bit of Mexican Day of the Dead flavor. See that several tin containers as packaging almost set up a collectables situation. Interestingly this Halloween Sugar Skull Shelf-Top Merchandising seen at Staples.